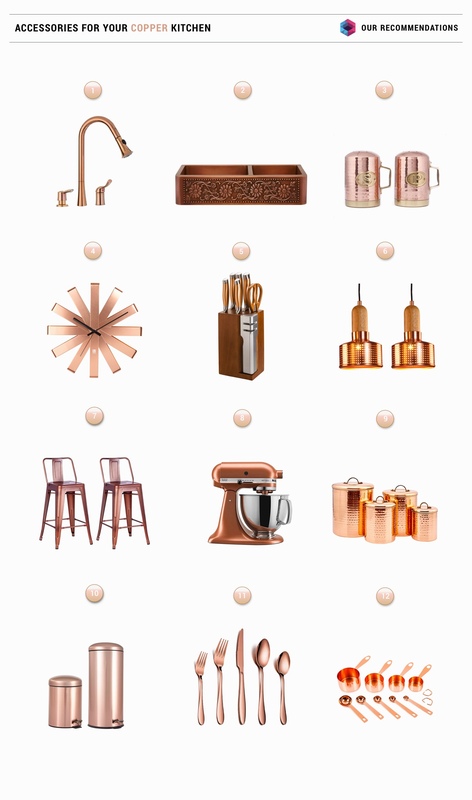 Shine up your new kitchen design with a copper theme, like these 36 gorgeous copper kitchen designs. 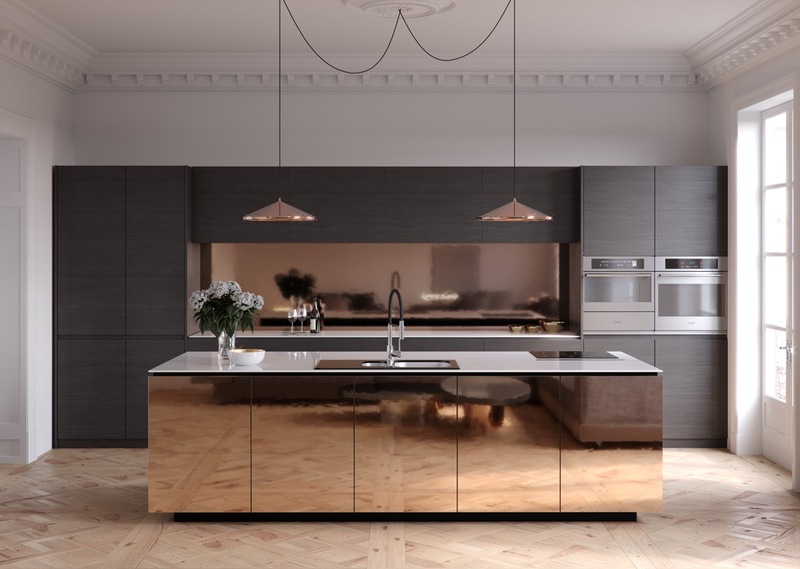 Polished copper kitchen cabinets, countertops and backsplashes have a stunning luxe look in their warm sheen, which is enough to take just about any design up a notch or three. 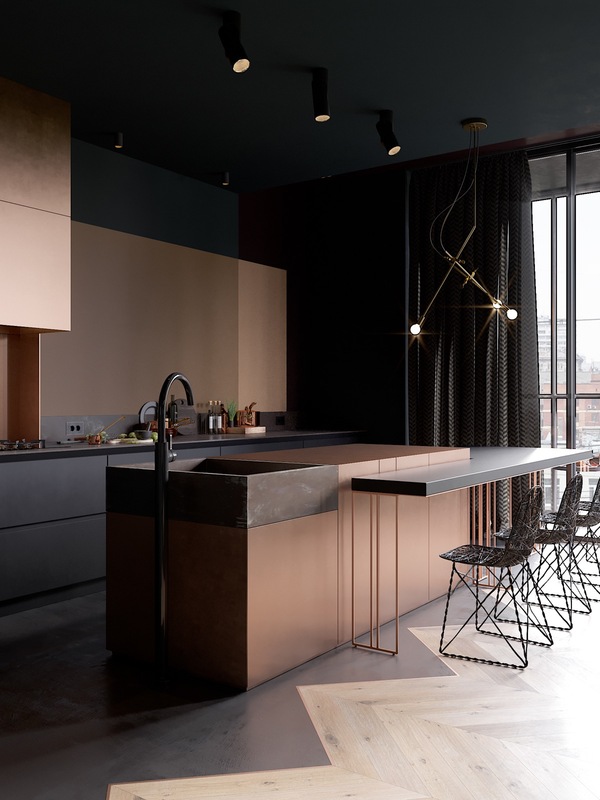 Copper is also very versatile, in that it can be used with an aged patina to suit an industrial interior or a more traditional setting. 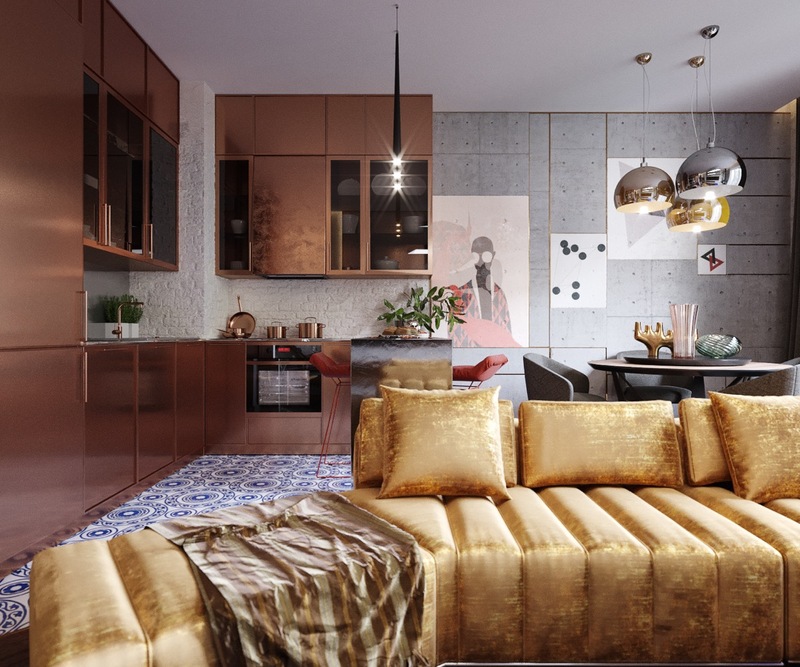 If all out copper creates too much bling for you then you could always enjoy this aesthetic through smaller copper accents, like a copper cooker hood, light fixtures, kitchen stools, and some copper kitchen handles - or update existing decor with a set of copper kitchenware. Fresh and fancy. 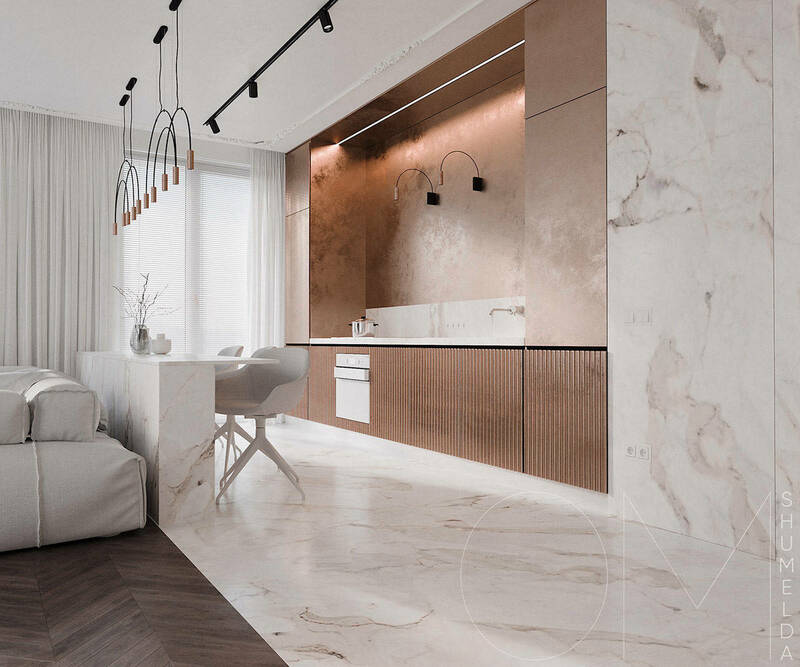 A white and copper kitchen has a fresh and simple minimalist feel, whilst still hitting a high-end finish. More images of this pastel home here. Small is beautiful. 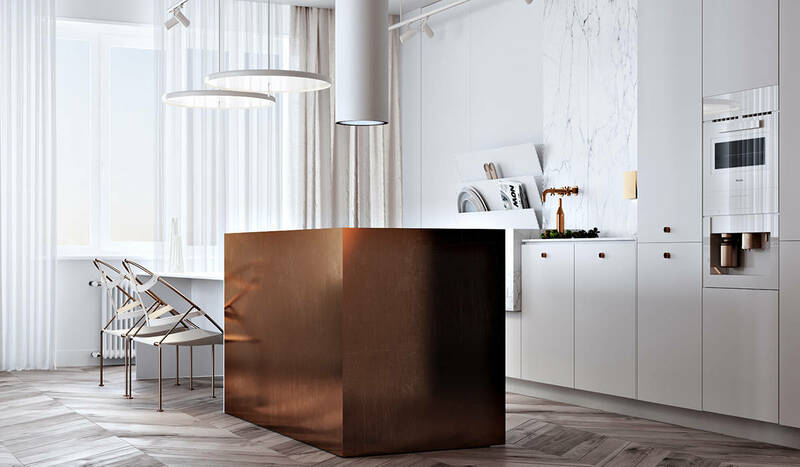 Even the tiniest installation, like this corner copper kitchen arrangement, can have a massive impact on the room. Crown with copper. 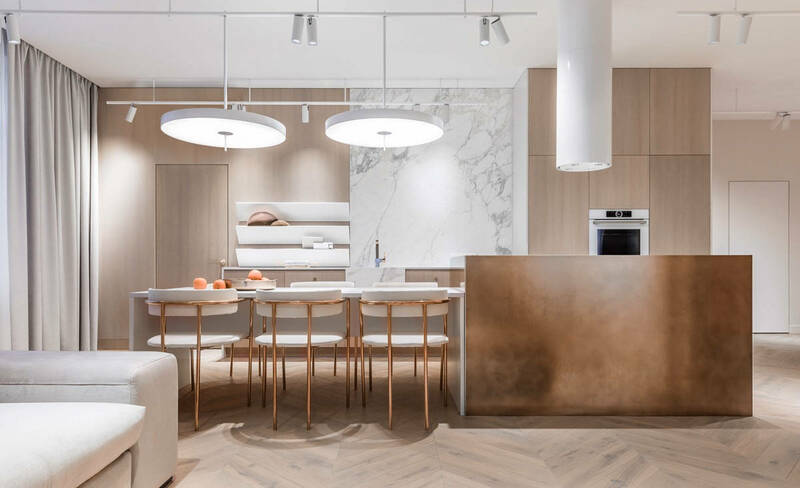 Not only does this kitchen design have a long and luxurious copper kitchen island, but there is also a hammered copper soffit to top off the taller white units behind it. Mirror, mirror, on the wall, who is the shiniest copper of all? 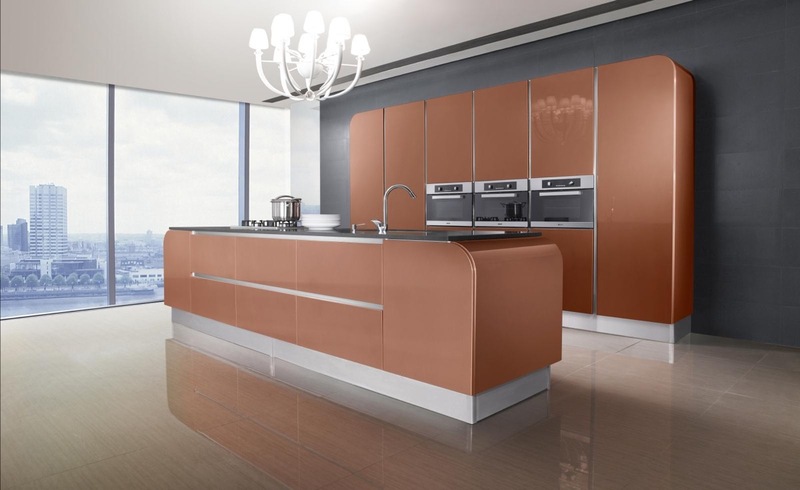 Mirror finish copper not only looks magnificent, but it also reflects the room to increase the sense of open space. Bejewel the room. 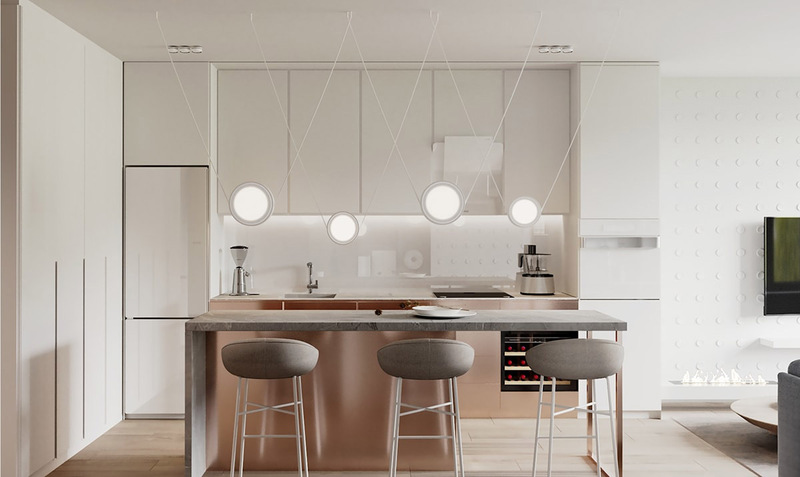 Dangle copper kitchen light fixtures low over a kitchen island to give your kitchen some copper pendant jewellery. Reinvent the room. 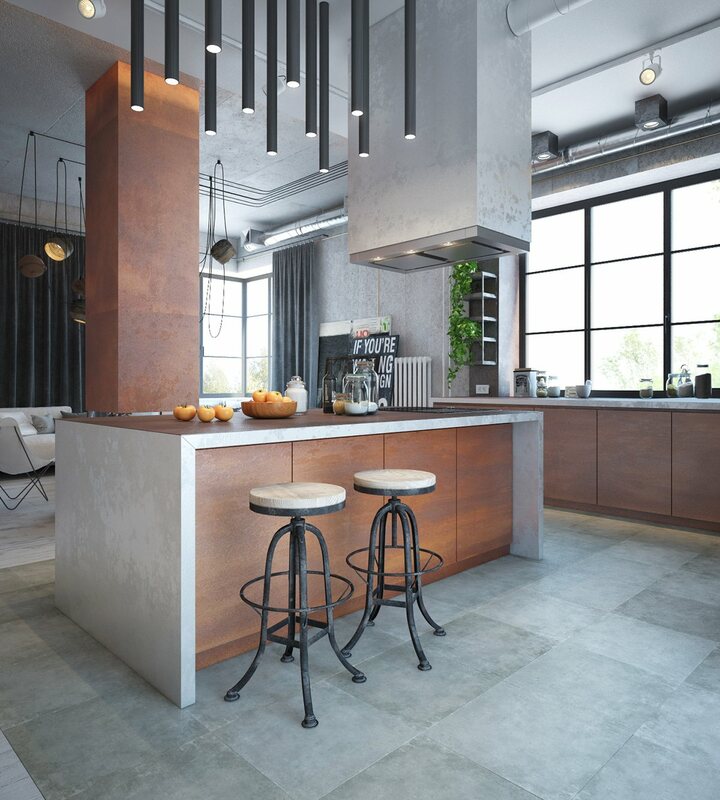 Let coloured light play over your metallic finish to create different looks and moods. Tint with texture. 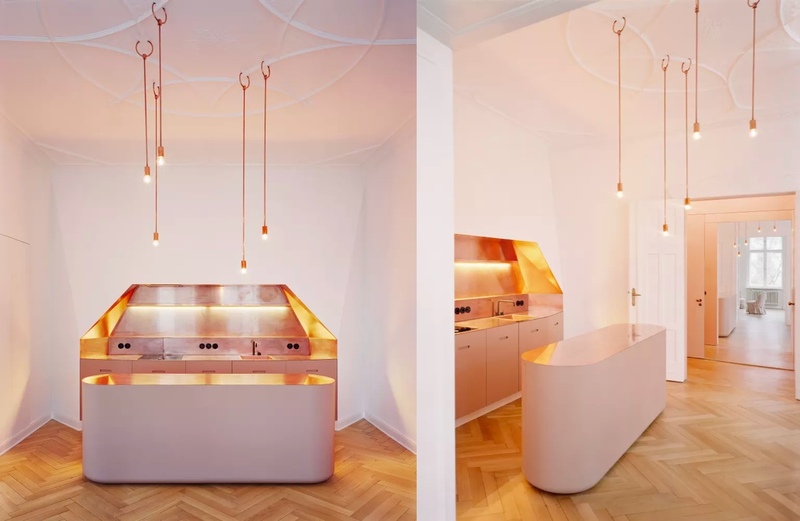 These copper base units have a slightly darker appearance to the upper cabinets due to the shadows created by their ribbed surface. 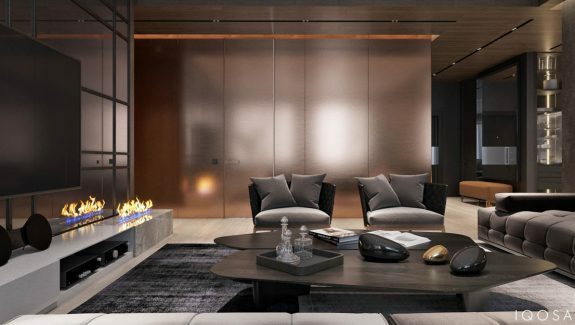 Find more images of this luxe home here. 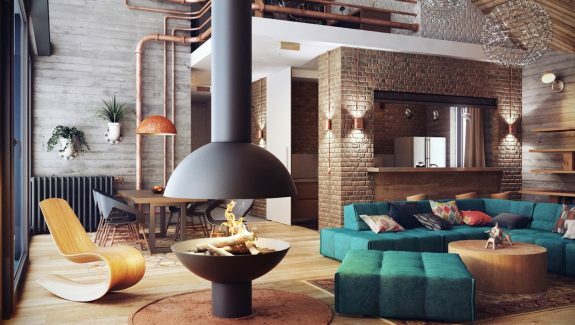 Add character with copper. 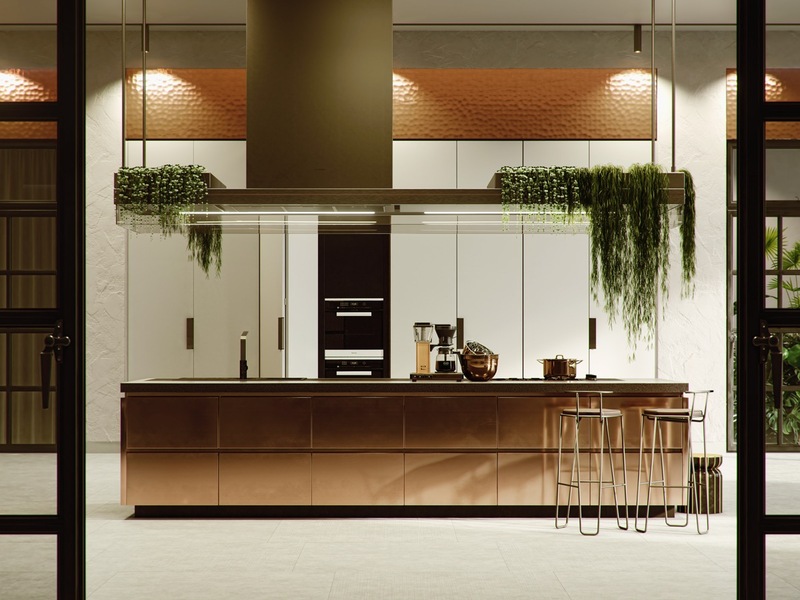 A gently aged patina crosses this deep copper backsplash, giving the modern all white kitchen a little age and interest. 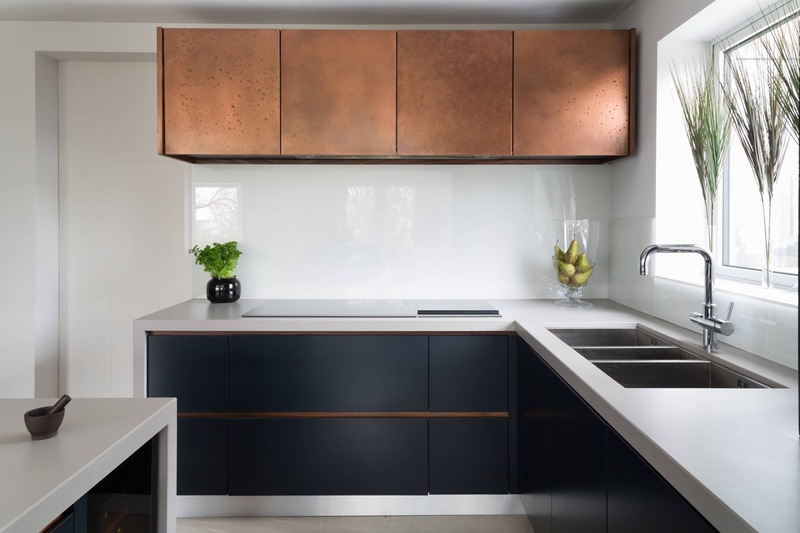 On the flip side, this high shine smooth copper backsplash dramatically brightens up a grey and raw concrete kitchen design. Team up copper and turquoise kitchen accessories. When oxidised, copper turns a beautiful shade of pale green, just like the Statue of Liberty. So whether you accentuate the beauty of patinated copper with a copper kitchenAid or a turquoise one could be the subject of some debate. 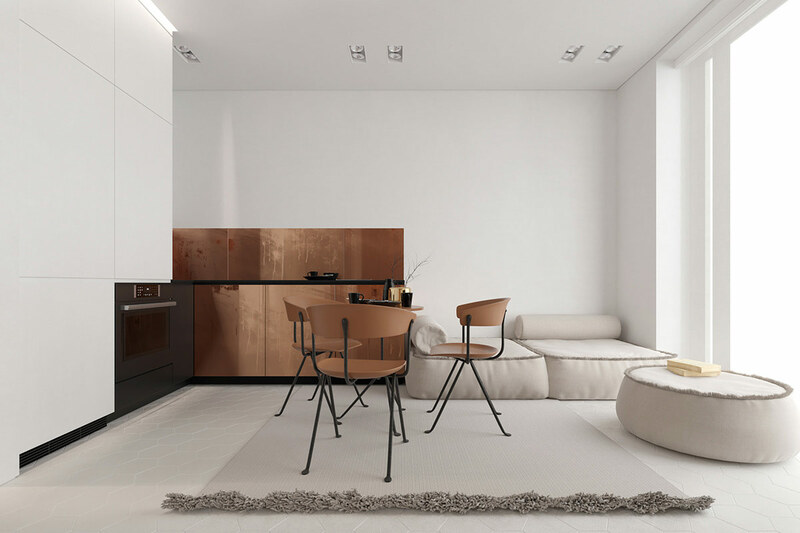 Increase a copper theme with smaller accents. 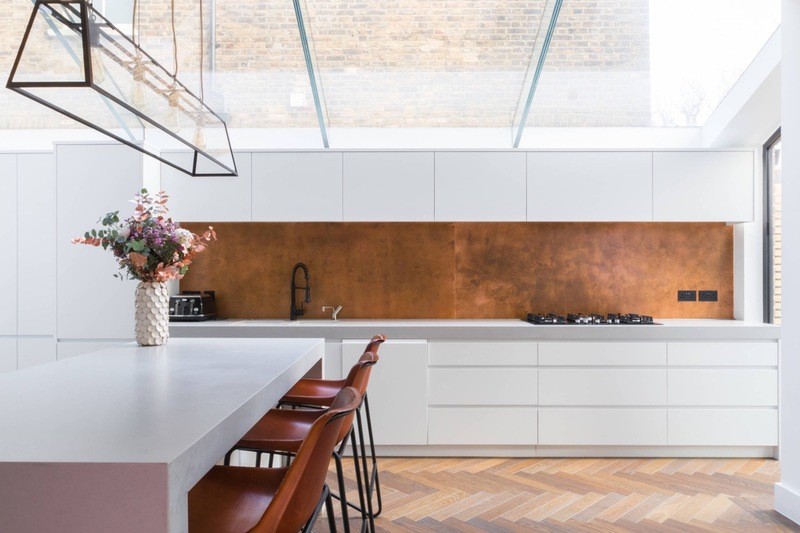 The effect of this copper kitchen island is stretched out by the addition of copper dining chairs along a white dining extension. 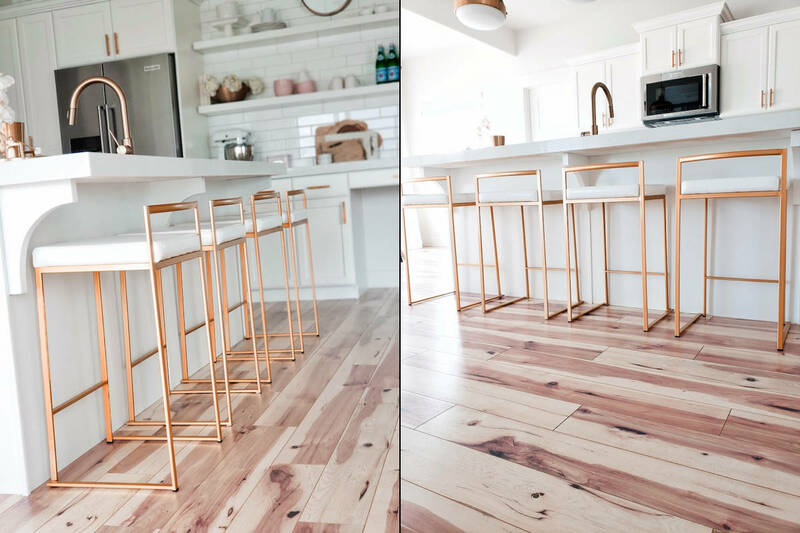 Copper bar stools provide the seating in this kitchen, which match a copper kitchen faucet with sprayer and copper kitchen handles. 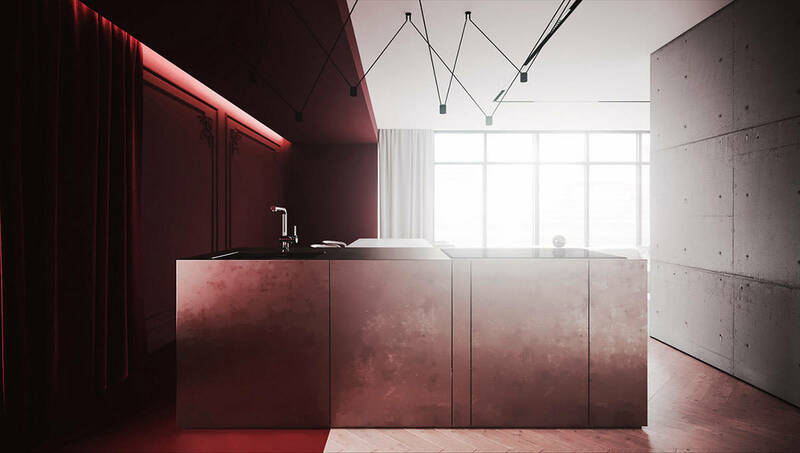 Make copper the core of the design. 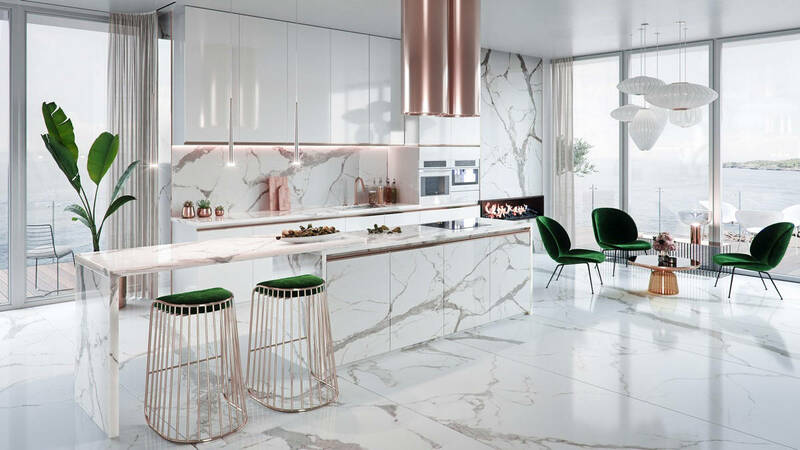 A copper kitchen hood forms the centre of this luxurious white marble kitchen with green accents. 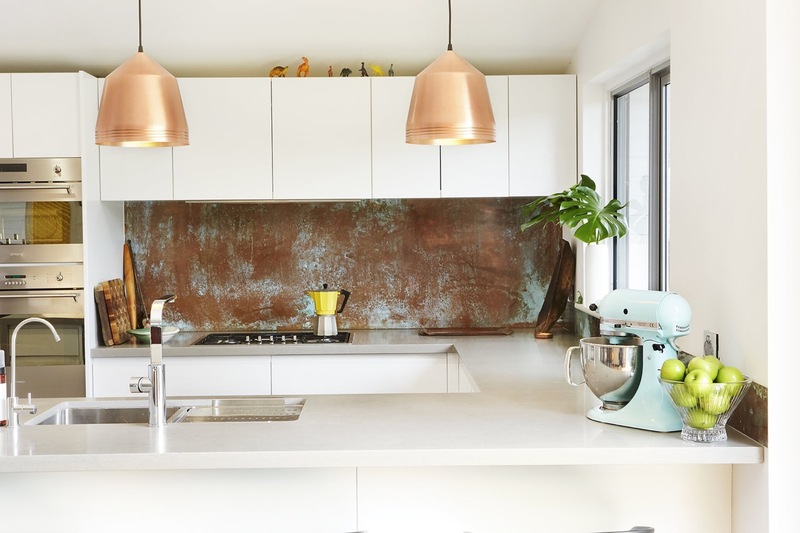 The cooker hood in this kitchen is part of a large copper volume, textured with patina. Give your metallics room to breath in the scheme. 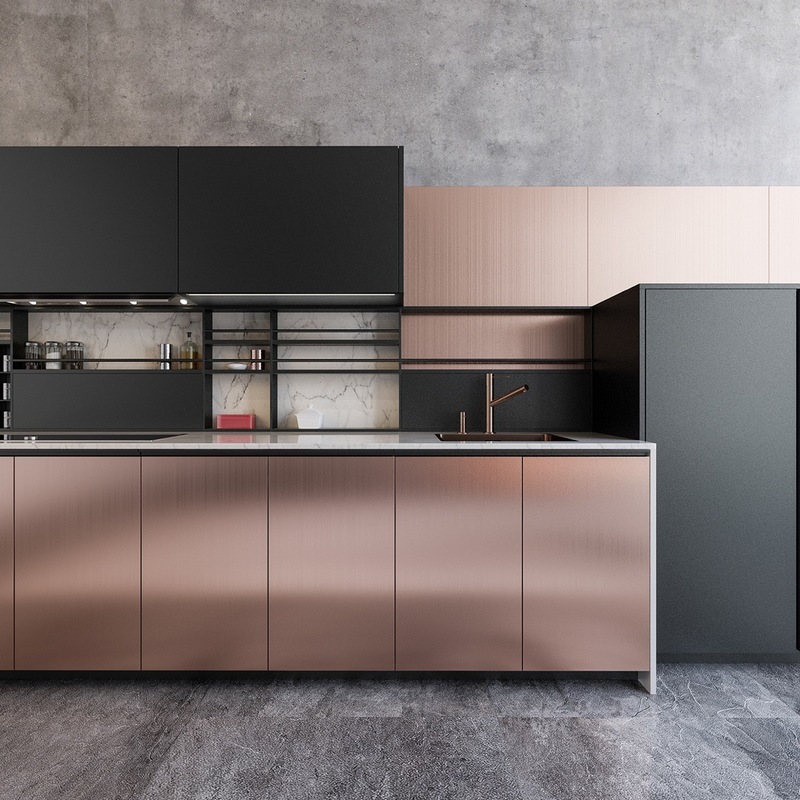 This two tone copper kitchen set looks uber smart cut through with white. Create a sculptural volume. This singular cuboid volume dominates like a large piece of abstract sculptural art inside a gallery white room. More images here. … Or use equal measures of copper and dark notes to achieve chic balance. Meet with more metallics. 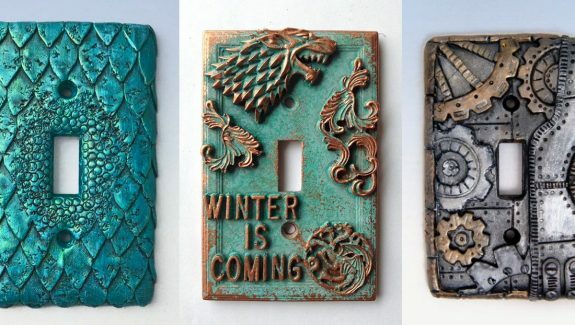 You can combine copper elements with other metals too. 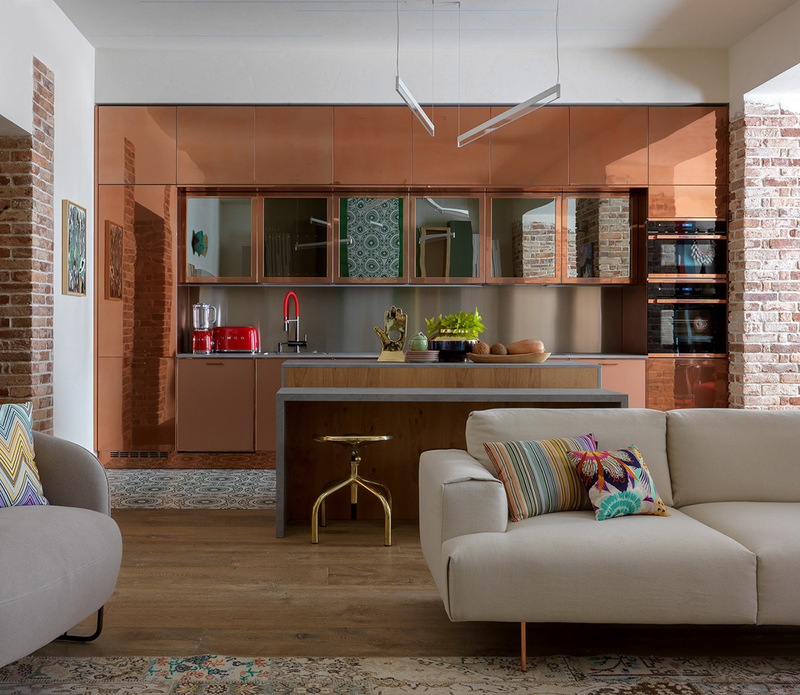 In this design, a mirrored silver American style fridge freezer complements copper base units. 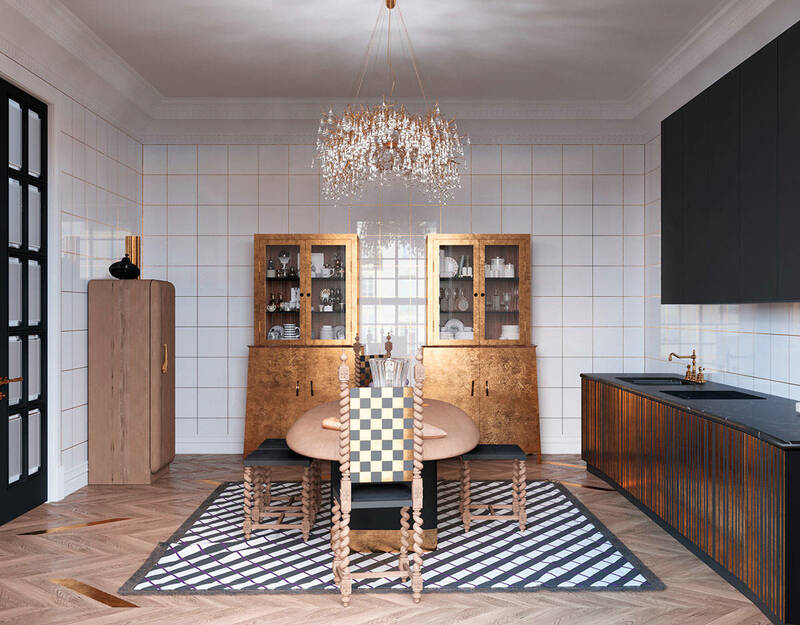 This time, its gold accents that brush up beside a fully fledged copper kitchen run, in the shape of a gold kitchen bar stool and a golden sculpture. Another take on the gold meets copper theme. This time golden sofa upholstery shimmers in the forefront. 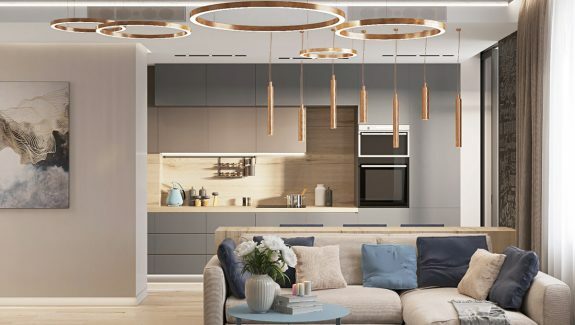 A trio of metallic pendant light shades bring metallic tones to the open plan dining area. 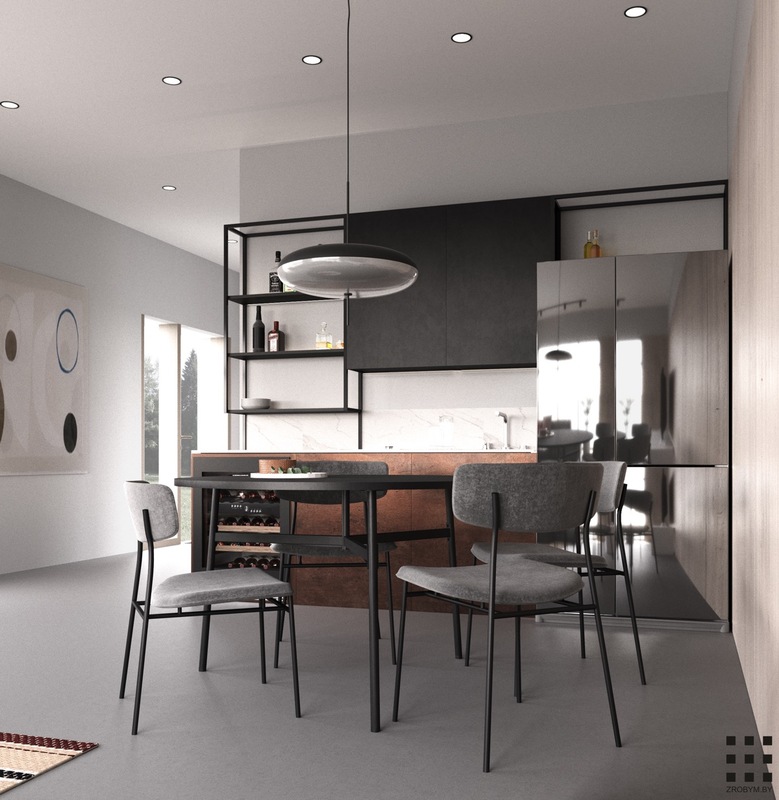 Build the look with blocks, like this linear kitchen with an end block sink. 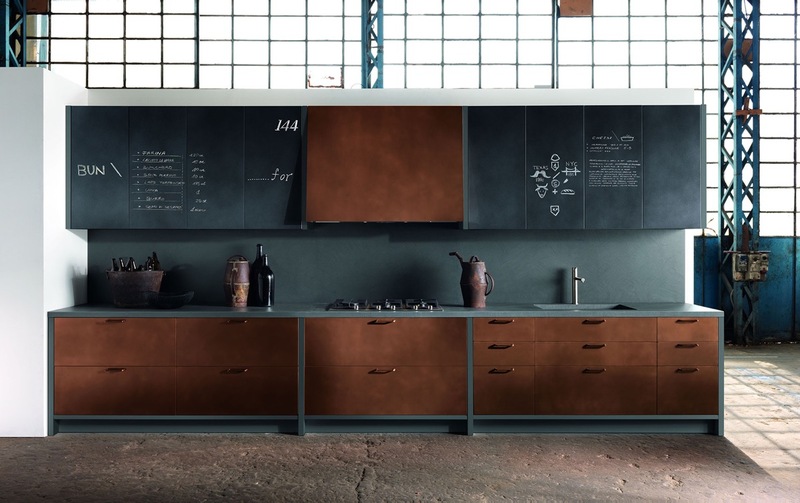 Concrete, copper and chalkboard, make a characterful composition. Curvaceous cooper looks cutting edge. 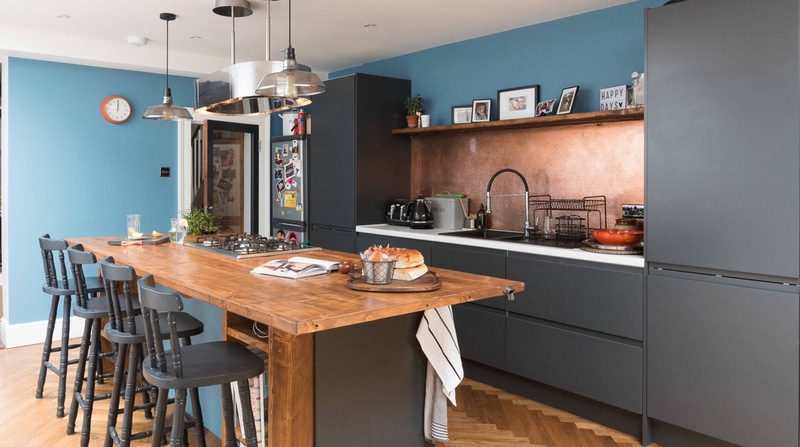 Blunt the effect of bright copper with cooling blue decor. 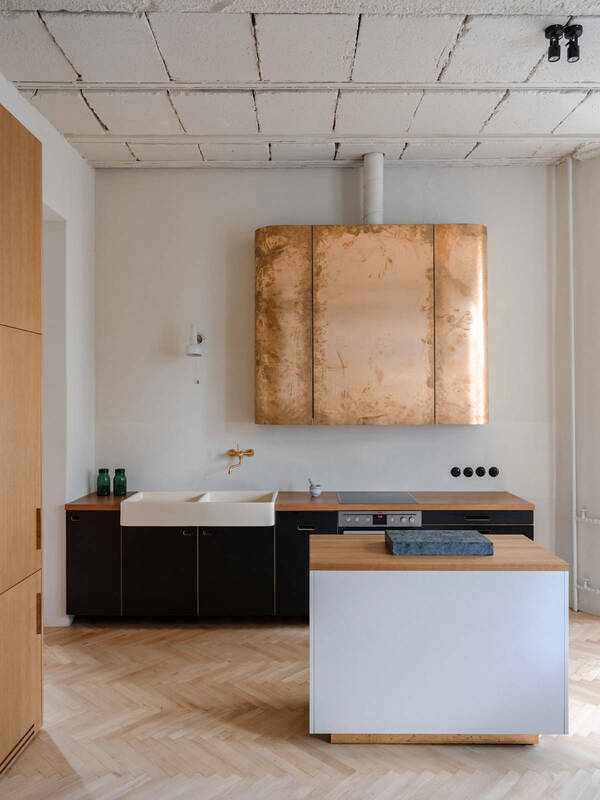 Concrete countertops on copper units looks chic and unique. 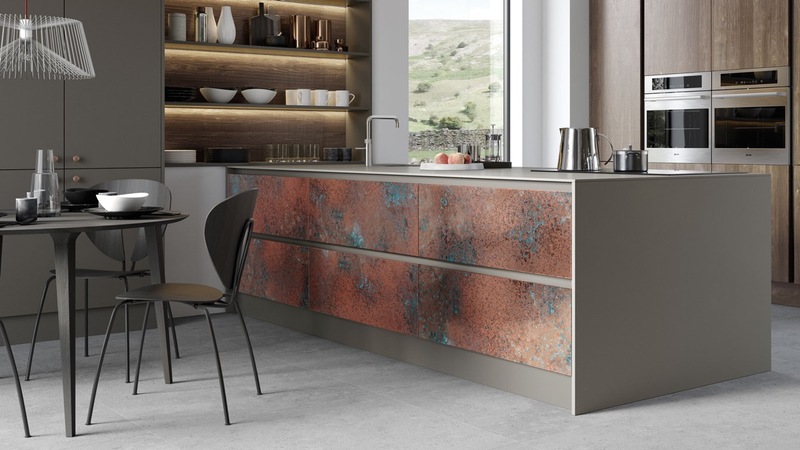 Crisp and clean looking countertops offset patinated copper drawer fronts in this design. Cultivate an enlivened room scheme. 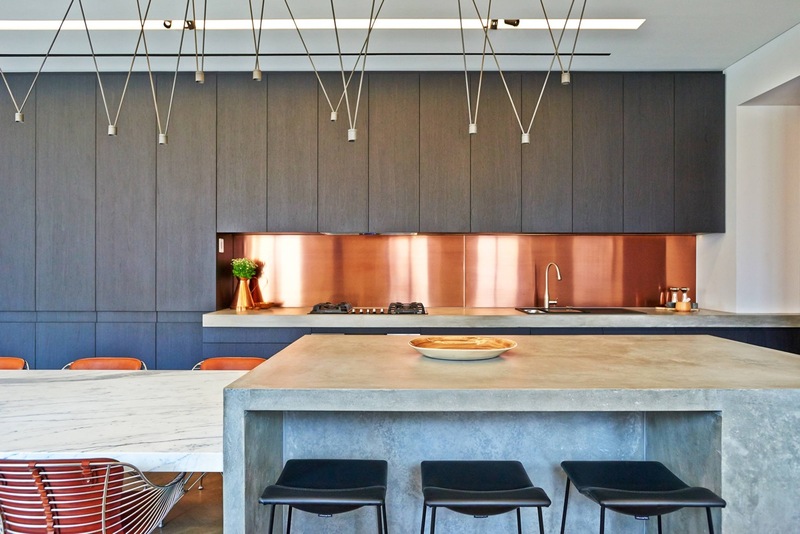 Live greenery provides a revitalising stripe against this copper kitchen backdrop. It’s all in the details. 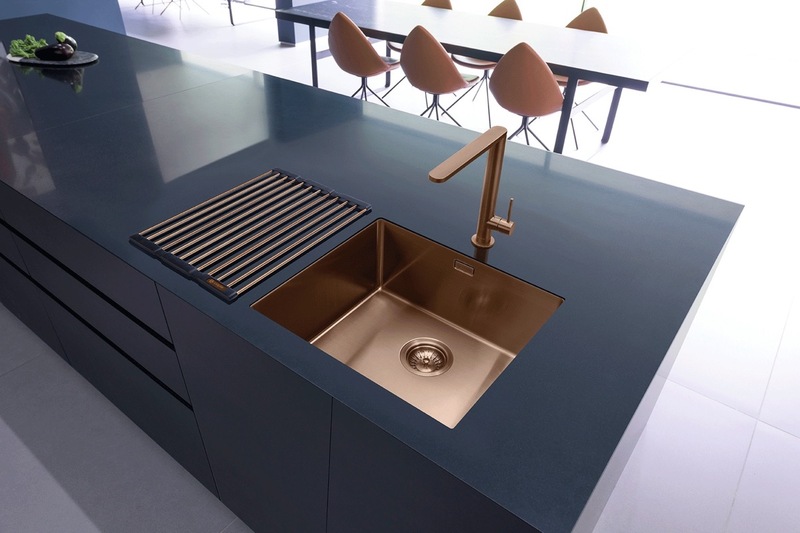 A copper trivet, faucet and copper undermount kitchen sink bring a bounty of richness to a plain black kitchen island. 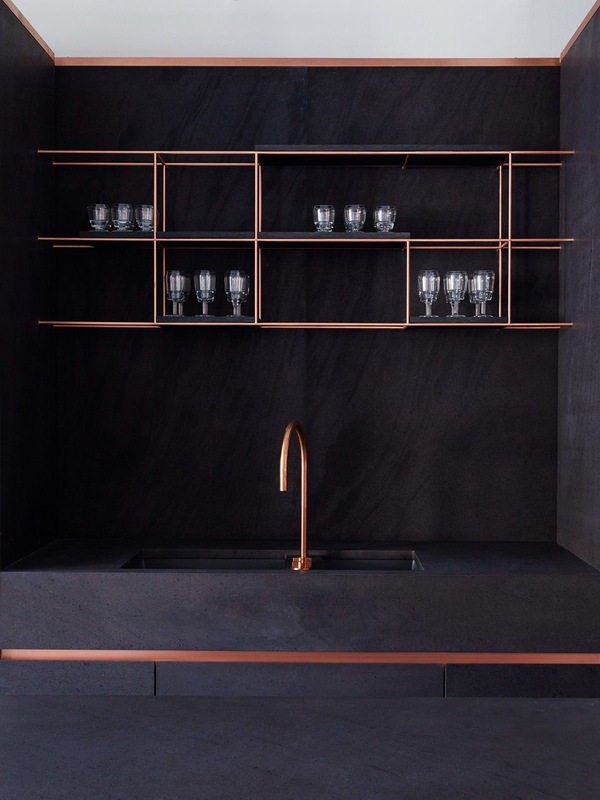 Copper shelves adorn this black kitchen decor. 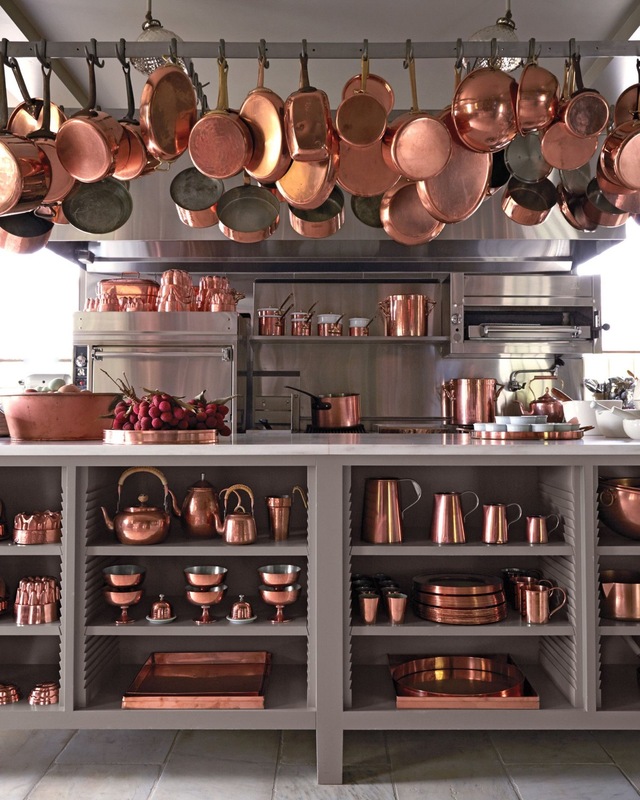 Copper kitchenware looks great but do note: copper leaches into food when heated, leading the US Food & Drug Administration (FDA) in the US to caution against using unlined copper pans for general use. Copper can be both delicate and strong. 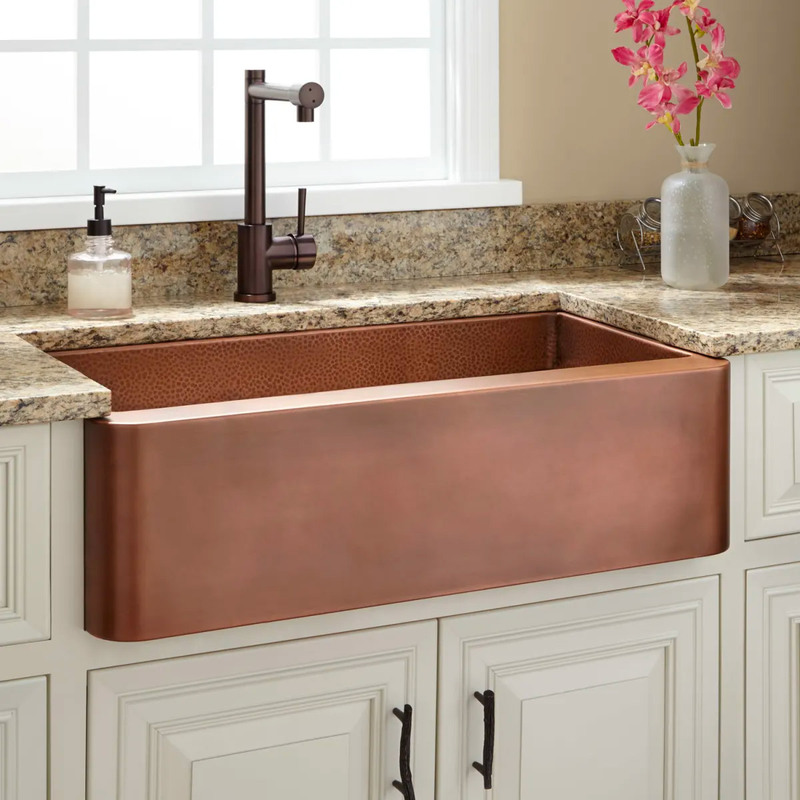 Copper gets patina and sometimes scratches, but a hammered finish–like the interior of this copper farmhouse kitchen sink–gives it a more durable finish. 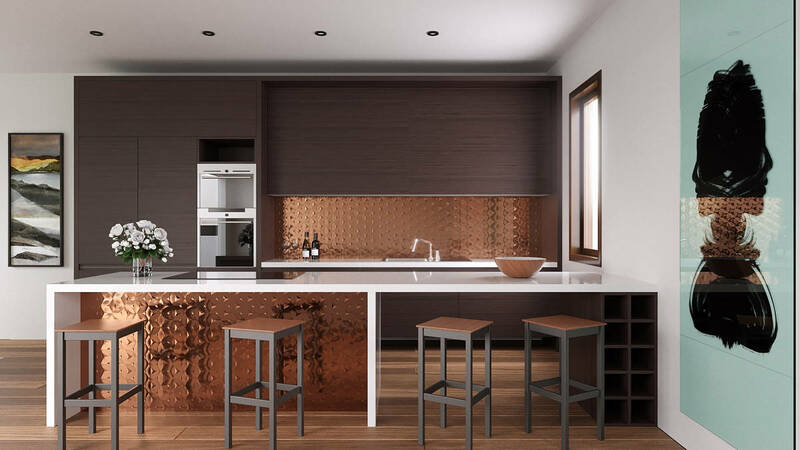 These textured copper panels work to disguise any dings that daily life may bring. Copper stretches through the ages. 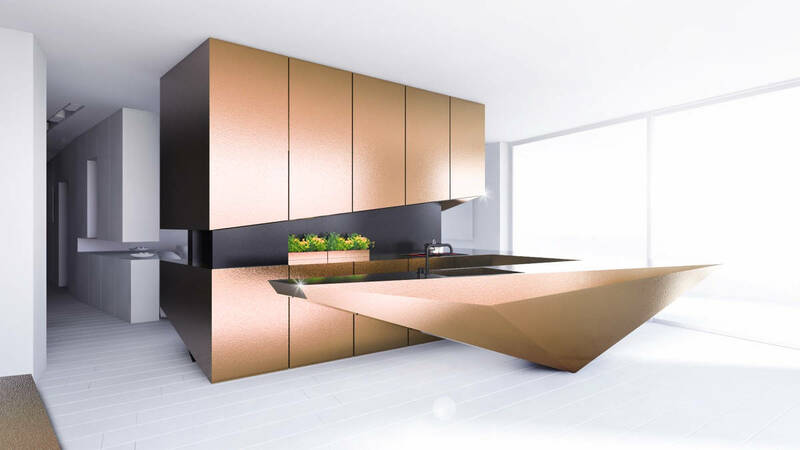 Fashion a futuristic copper kitchen with a geometric island design. 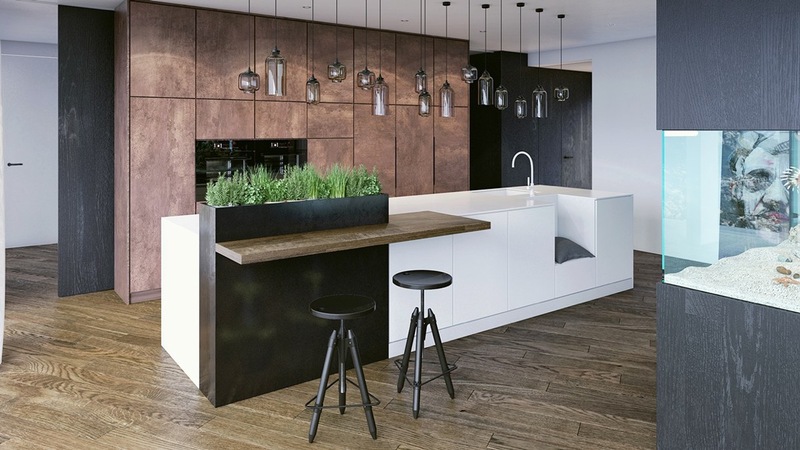 A wood and copper kitchen combo works in perfect harmony. 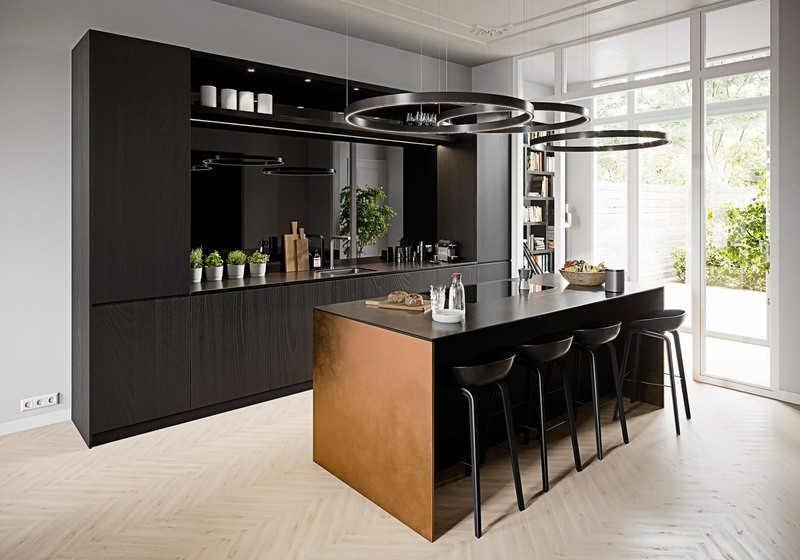 Black decor and accents dramatise the look. Take it to the floor. 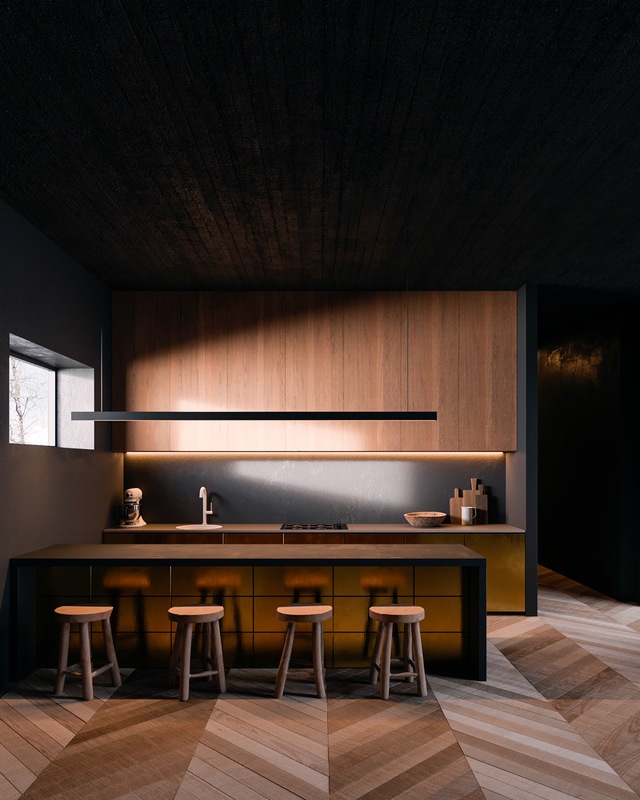 This wood herringbone floor is filled with glorious flashes of blazing copper. Two matching copper dressers complement the grandeur of high backed dining chairs, which have a copper chequerboard design.